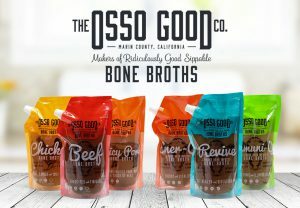 Thanksgiving Recipes Using Bone Broth - The Osso Good Co.
Thanksgiving recipes using bone broth that will make your whole family rave! We love, LOVE Thanksgiving and spending time with our friends and family. Bone broth has been a chef’s secret weapon for centuries. An easy way to get your family and friends talking around the dinner table during thanksgiving is to add bone broth to your favorite recipes! Thanksgiving recipes using bone broth will not only supply the benefits of bone broth to your favorite Thanksgiving recipes, but also make it POP with flavor! Check out some of our favorites below! This Thanksgiving recipe is a real treat! Rich, savory, and of course, calls for Osso Good Bone Broth for an added punch of umami and nutrients. Thanksgiving wouldn’t be Thanksgiving without preparing root vegetables to add to the spread. Drizzle a mixture of olive oil and warmed Osso Good bone broth over halved brussel sprouts, parsnips, sweet potatoes, and carrots. Roast for 30 minutes, or until just browned. While it doesn’t require flour or starch, it does require time to thicken this delicious paleo reduction. Mince garlic, shallots, and fresh herbs. Add to a heated, buttered sauce pan and cook until fragrant. Deglaze with white wine of your choice. Reduce the white wine by more than half, right about when it starts getting a little syrupy. Add a generous amount of Osso Good Bone Broth. Reduce. Once it’s starting to coat the spoon, turn off the heat, toss in a few tablespoons of cold butter, raw egg yolks, and maybe some cream. Stir and season to taste. Perfect topping for your turkey and stuffing! Simmer 4 pounds of parsnips in 2 cups Osso Good and 1 1/2 c water for 20 minutes. Strain parsnips, but keep liquid for later. Mash parsnips and add enough broth until you have the desired consistency. Add salt, nutmeg, and cinnamon to taste. Ok, ok… this recipe doesn’t include bone broth, but topped with fresh whipped cream, this recipe is Osso Good! We hope you enjoy these delicious Thanksgiving Recipes with your friends and family!